Springtime, what a wonderful time to plant. You’ve probably guessed the purpose of this blog if you’ve read the title, so without further ado, here’s Everlast Services’ recommendations on what to plant this spring in Melbourne, Australia! A staple classic, broccoli is a sturdy plant that does well in cool temperatures and is rich in vitamins. Broccoli grows best in full sunlight, and loves moist, fertile soil with a touch of acidity. When planting broccoli, between 5 to 10 centimetres of quality compost will go down an absolute treat. Plant your seeds about 15 millimetres deep, with a spacing between seeds of about 40 centimetres. Broccoli will take roughly 12 weeks to be ready for harvest, and has the unfortunate property of being delicious to caterpillars. To ward off these pests, a homemade solution such as chilli spray should do the job nicely. Used in cuisine all around the world, coriander is a super herb. It’s best to grow coriander in the cooler months of the year, and springtime is just about perfect. The ideal coriander crop grows nice and leafy, and you want it seeding as little as possible. Coriander loves the sun and may be grown in pots as well as in the garden. You don’t want to saturate your coriander seeds, but well-drained soil along with a regular supply of fertiliser and water will do the trick. When planting coriander, sow your seeds about 6 millimetres deep about 10 to 20 centimetres apart. Rows should be about 24 centimetres apart. Coriander generally takes between 30 to 45 days before it’s ready for harvest. A trick to take on board when growing coriander: keep moist, so as to ensure a leafy crop that won’t take to ‘bolting’. Tomatoes are a classic spring plant. Delicious in so many types of food it should be illegal, these are an awesome crop to grow. As delicious a food they might be, they can be a tad tricky to grow properly. 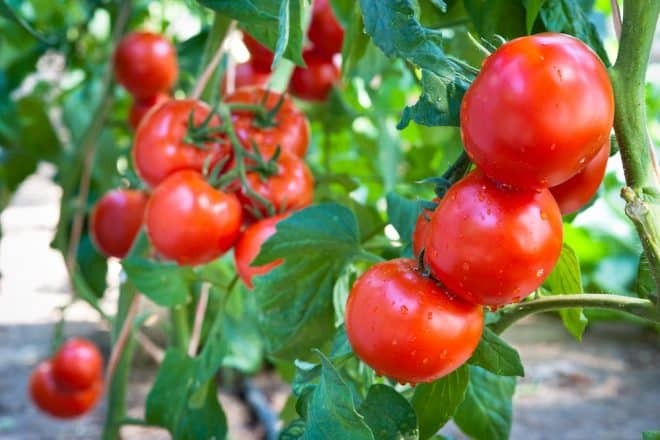 Tomatoes love full sun, and thrive if they receive 8 hours per day. The more fertile the soil, the better, and they need consistent moisture, too. Implanting a stake for support can be necessary, especially if your area experiences high winds. When planting tomatoes, each seed requires a patch of soil 60 by 60 centimetres in area. A depth of about 20 centimetres should suffice for seeding, and you’ll want to dig the site through until the soil is fine and crumbles easily. As the plant begins to grow, you can tie it to a stake for protection. There’s quite a bit to nurturing your budding tomato plant. They’re thirsty devils, and strong feeders. After one month, tomatoes require roughly double the nutrition than earlier in the growth cycle. At this point, you can switch from a bi-weekly cycle to feeding once per week. Soluble fertiliser designed for fruit will work a charm, and don’t let that soil get dry! Smaller tomatoes, such as cherry tomatoes, generally take between 65 to 70 days before they’re ready for harvest. Bigger tomatoes will take quite a bit longer. They will be ready for picking when the fruit starts to colour. Leave them on a window sill to ripen if you’re a caring soul who believes tomatoes deserve protection. As with broccoli, caterpillars love to feast on tomatoes. Unless you’re great mates with your local caterpillar family, we recommend disposing of these critters post haste. Vegetables: beetroot, cabbage, carrot, capsicum, cauliflower, corn, cucumber, celery, eggplant, leek, onions, lettuce, peas, spring onions, spinach and zucchini.